The government wants to 'silence' the Ganajagaran Mancha movement since it no longer serves the interests of the ruling party, Imran H Sarker has alleged. 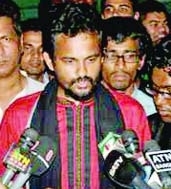 Sarker was removed as the Ganajagaran spokesperson on Saturday afternoon by others in the group. In his defence, Sarker said, "The [ruling] Awami League and its affiliates have been saying that the Mancha is no longer needed." He said the recent attacks by Chhatra League activists and police on Mancha activists at Shahbagh and the press conference on Saturday where he was declared removed as spokesperson appeared to be part of a plan. "It is obvious that the government wants to silence the Mancha's voice and destroy it," Sarker claimed. He alleged that the ruling party affiliates were upset with the Mancha because it was protesting the delay in the war crimes trials. "I don't know many of those who were present at the Saturday press conference. But I am told a top Awami League leader was responsible for organising it. Most of those at the press conference are connected to the Awami League and its affiliates," Imran Sarker said. He said the Hifazat-e Islam chief Ahmad Shafi's Friday statement also gave enough indication of the government's position on the Ganajagaran Mancha. "Since I am the target of all the diatribe as spokesperson of the Mancha, I think I have greater responsibility for the people," Sarker said. Two activists were injured in a clash on April 3 between the Mancha and another Shahbagh based group. Amid allegations flying back and forth, Imran Sarker was blamed for factional feuds on Friday by leaders of five student groups believed to be close to the ruling party.